NATO leaders agreed on Wednesday to invite Macedonia to begin accession talks to join the Western alliance, extending its reach in the Balkans in defiance of Russia following a landmark accord with Greece over the ex-Yugoslav republic's name. Macedonia will become NATO's 30th member state, though its people must first back the deal with Greece in a referendum. Under the accord, the official name of the country will become 'Republic of North Macedonia'. "We have decided to invite the government in Skopje to begin accession talks to join our alliance," the leaders said in their summit communique. 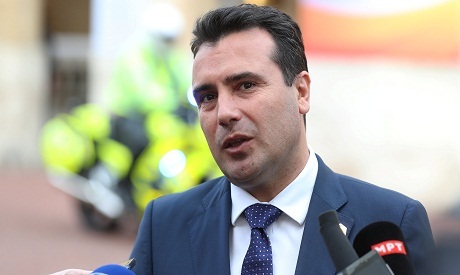 The government of Macedonian Prime Minister Zoran Zaev pushed for an agreement with Greece after coming to power in 2017, and the compromise on the name opened the way for Macedonia's membership of NATO. "This is a once in a lifetime opportunity and either they (the Macedonian people) support the agreement and they can join NATO, or they don't support the agreement but then they won't join it. They cannot get both," NATO Secretary-General Jens Stoltenberg told a news conference after the decision. Moscow's ambassador to Skopje has criticised Macedonia's ambitions to join NATO, saying it could become "a legitimate target" if relations between NATO and Russia deteriorate further. Macedonia will bring to NATO an 8,500-strong military which relies on a mixture of Russian, German, Greek and U.S. tanks and armoured vehicles. Its aviation has no combat jets.